A simple Fibonacci analysis of the daily Facebook (FB) chart going back to January 2017 reveals a interesting technical intersection in both time and price. Facebook shares have been in rally mode for most of the look-back period, except for the February to March broader market pullback period. Since that pullback the technology sector has rallied to new highs, while the S&P 500 Index has failed to make a new high. The Facebookdaily chart is overlaid with a Fibonacci time series indicator (green vertical lines) using January 2017 as the start point. The lines are marked along the date axis following the Fibonacci number sequence. It shows the Friday session was the start of the 12th Fibonacci zone or more simply, it was the 144th day since the start of the measurement. These time zones can be used to anticipate potential price reversals. The blue horizontal lines are Fibonacci retracement levels measured off the same January 2017 low and the June high this year. This is an arbitrary range because the June high has not yet been definitively confirmed as the long term high level. But when we apply this range to the Facebook chart the retracements fit very well. The March low is a 62% retracement and key support-turned-resistance in the $170 area would be the 38% retracement level. The take away from this conjecture is that the June high may turn out to be an important high and a key technical level. The chart then reflects an intersection of Fibonacci measurements and it suggests that Facebook is at a critical point in both time and price. It was a volatile first half of this year. The S&P 500 Index moved in a 12% range similar on a percentage basis to its opening range in 2016. But while the price ranges were similar the direction of price movement was not. The monthly and daily charts show several dissimilarities between the opening halves of 2016 and 2018 and what they could mean for the market over the next six months. In January 2016 the S&P index dropped sharply and then spent the next five months moving higher. It finished the first half of that year at the upper end of its six month range and formed a bullish hammer candle. The index went on to rally another 36% over the next 18 months. The S&P rallied sharply in January of this year and then dropped in February to the low end of its six month range. It has moved off that low but is nowhere near the high end of its six month range. In fact, just as the price action in January 2018 was the inverse of the price action in January 2016, the price action to finish out the month of June was too. Instead of the bullish hammer candle that formed in June 2016, a bearish “gravestone-like” doji candle formed at the end of trading in June this year. A gravestone doji or inverse hammer is a candle with a long upper wick and a narrow opening and closing range, situated at the lower end of its overall range. It suggests an inability to hold higher levels and is considered a bearish reversal indication. 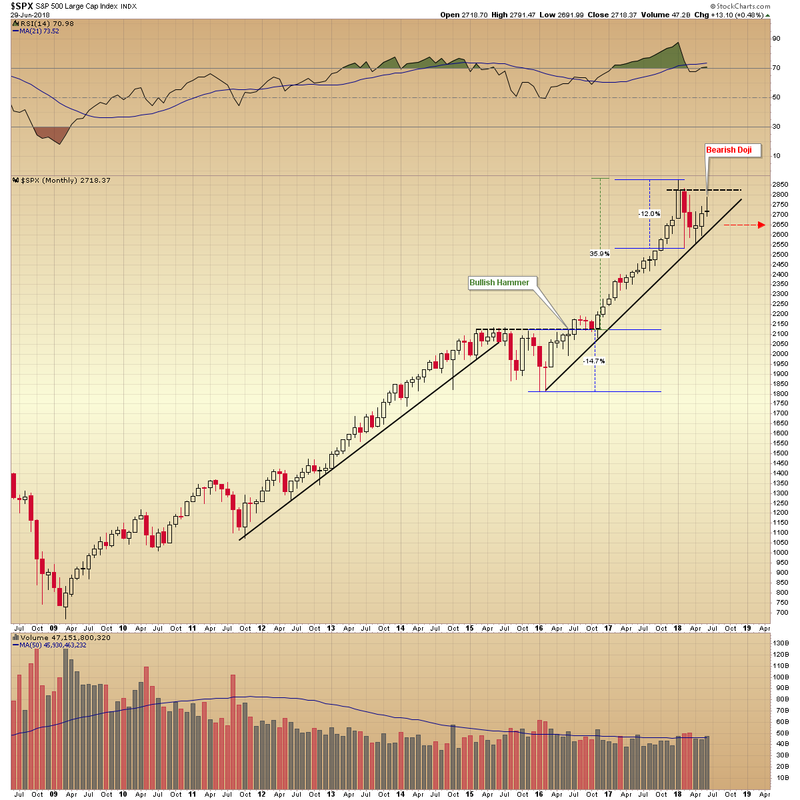 The S&P monthly chart also includes a long term uptrend line. Support is currently situated in the 2650 area. The long term trend remains intact until that trend line is breached, but at a minimum it looks like it will be retested. Support and resistance levels on the weekly and daily timeframes are identical and are highlighted on the daily chart. A triangle pattern formed in the first five months of trading on the S&P chart this year. It is defined by a series of lower highs above static horizontal support in the 2580 to 2560 area, around the 200 day moving average. The index broke above the triangle downtrend line in May and has since made a series of higher highs and higher lows. 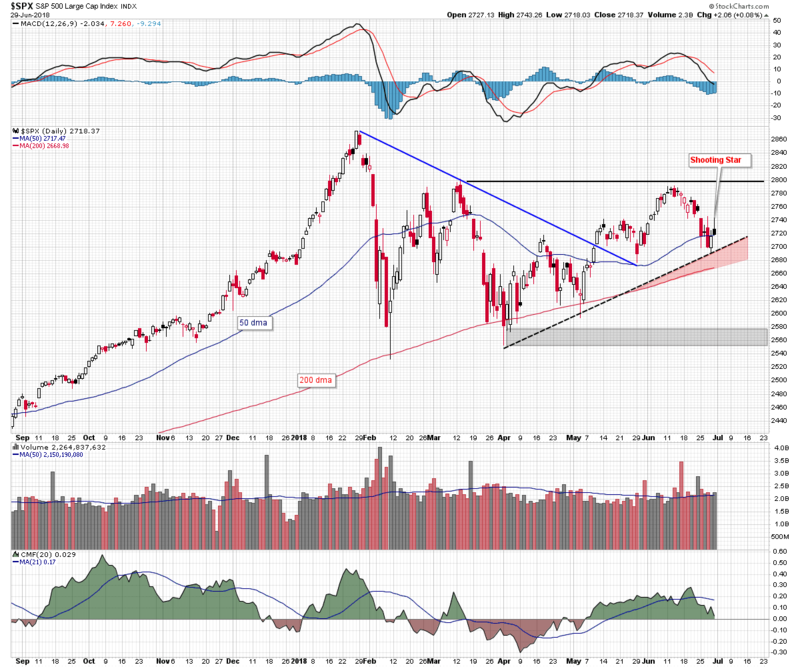 It recently moved lower to retest the three month trend line just above the 200 day average, and those two key support levels now define an important zone of support. The daily candle that formed in Friday’s session just above the 50 day moving average is also similar to the monthly candle, but it is not quite a gravestone doji. It does have a high upper wick but a wider opening and closing range situated at the bottom of the overall trading range. It resembles a shooting star candle and again, reflects an inability to hold its upper range. 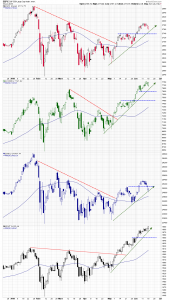 Moving average convergence/divergence made a bearish crossover in June and the Chaikin money flow indicator crossed under its 21 period signal average. The price action in the S&P 500 index in the first six months of 2018 is not as impressive as it was in the first half of 2016, but it is still very constructive. The long and short term bullish trends are likely to be retested but at this point in time, they remain intact. 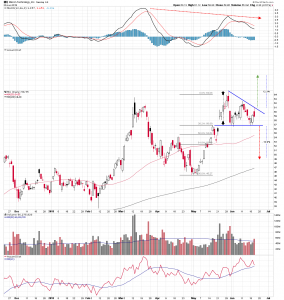 A technical pattern has formed on the Micron Technology (MU) chart that projects a potential 12% move in the share price. The stock rallied over 40% in May and this month it has been digesting those gains and consolidating in triangle pattern. The downtrend resistance line of the triangle was tested in Wednesday’s session and support is situated in the $57 area, which is also a 38% Fibonacci retracement of the May rally range. 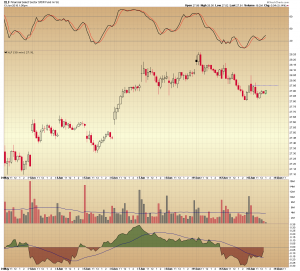 Micron closed near its session low today and on strong volume. The accumulation/distribution line reflects this selling pressure. Moving average convergence/divergence has made a bearish crossover and the oscillator is in slight negative divergence to the stock price. Shares could be headed for a retest of triangle support but that remains to be seen. They could just as easily reverse, breakout and continue on trend, leaving the technical indicators to catch up. In fact, the latter is more likely, considering the inertia of the May move. Breakout or breakdown, the pattern does project both an upside and downside target price. The measured move is calculated by taking the height of the triangle and either adding it to the breakout/resistance point or subtracting it from the breakdown/support line. In either case, it represents about a 12% move. The integrity of the triangle pattern support and resistance lines should determine whether Micron makes a new multiyear high or a has a downside rendezvous with the 200 day moving average. 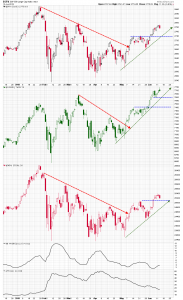 Following up on yesterday’s post about trend line support on the major market index charts, three of the four index charts held above their respective uptrend lines. 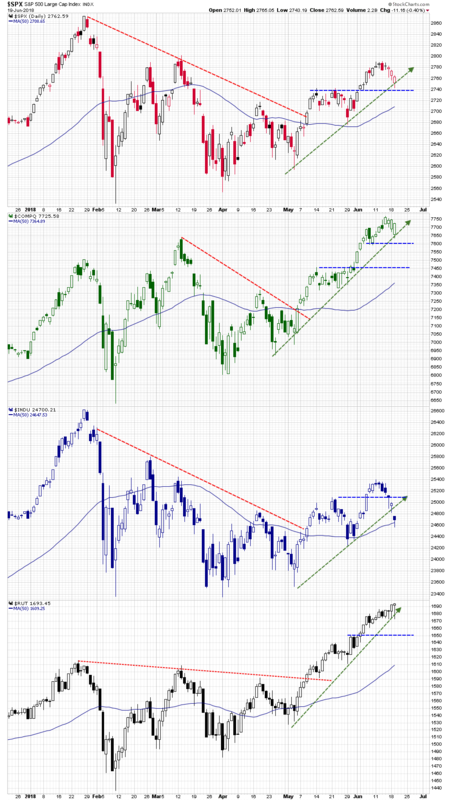 These support lines drawn off the lows since early May were tested on the S&P 500 Index, the NASDAQ Composite Index, and the Russell 2000 Small Cap Index during the Tuesday session. 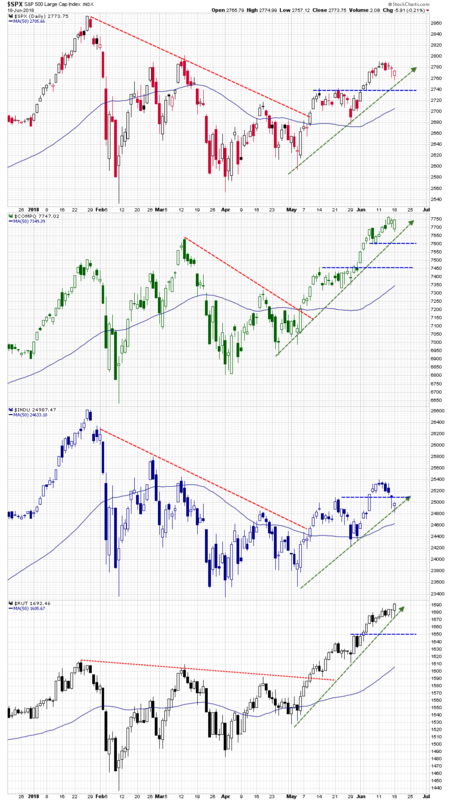 Each of those indices managed to hold above their trend lines and close near the highs of the day. It was impressive action considering the pressure stocks were under at the open. The Russell even managed to make another all-time high. The bad news is the Dow Jones Average failed Tuesday’s test but a bit of good news is the index was only down a little over a percent. It held at its 50 day moving average support and formed a hammer candle in the process. While the move lower in the industrial stocks will get a lot of attention, it was a neutral day for the other sectors in the broader market. What will go relatively unnoticed are the strong closes and the support levels that held through the session. 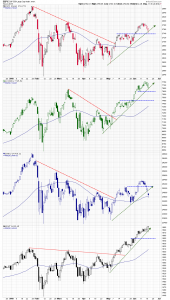 In Monday’s session the Dow Jones Industrial Average, the S&P 500 Index, the NASDAQ Composite Index, and the Russell 2000 Index each tested a two month uptrend line on their daily charts. Despite strong selling pressure in the morning, they fought back to close above their respective trend lines and form hammer candles. The formation of a hammer candle after a successful retest of support is considered very bullish. There are lots of reasons to remain bullish. On Monday the Russell made a new all-time and the other indices are not far behind, but there are those who are skeptical of the rally. They cite weak volume and the fact that indices like the NASDAQ Composite are weighted in such a way that a few stocks have a disproportionate influence on their movement. Overnight futures trading currently suggest that the indices will be under more pressure again tomorrow morning. 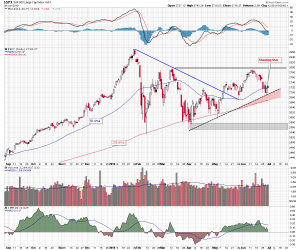 If they are able to repeat Monday’s performance and fight off this second downside wave, it would be upside follow-up and further confirmation of the intermediate term trend. 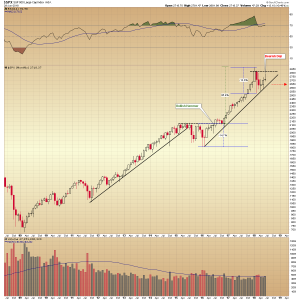 If not and the uptrend lines are broken, it would signal a potential shift in the intermediate term. Tuesday may be turn out to be a very important trading session. Apple (AAPL) is the largest holding in the Technology Select Sector SPDR ETF (XLK) and for the last two years the stock has consistently outperformed the fund as a whole. This year Apple is under-performing it, not by much, but more recently it has lost its leadership role as a XLK component. Make no mistake, it is a great stock and is up 33% over the last year and 12% year-to-date. But other major holdings of the fund like Miccrosoft (MSFT), Intel (INTC), Cisco (CSCO), and Visa (V) have been the dominant members of the technology fund this year. What does this change suggest for Apple going into the second half of the year? We are not sure. But this lagging dynamic is the backdrop for a speculative short trade. 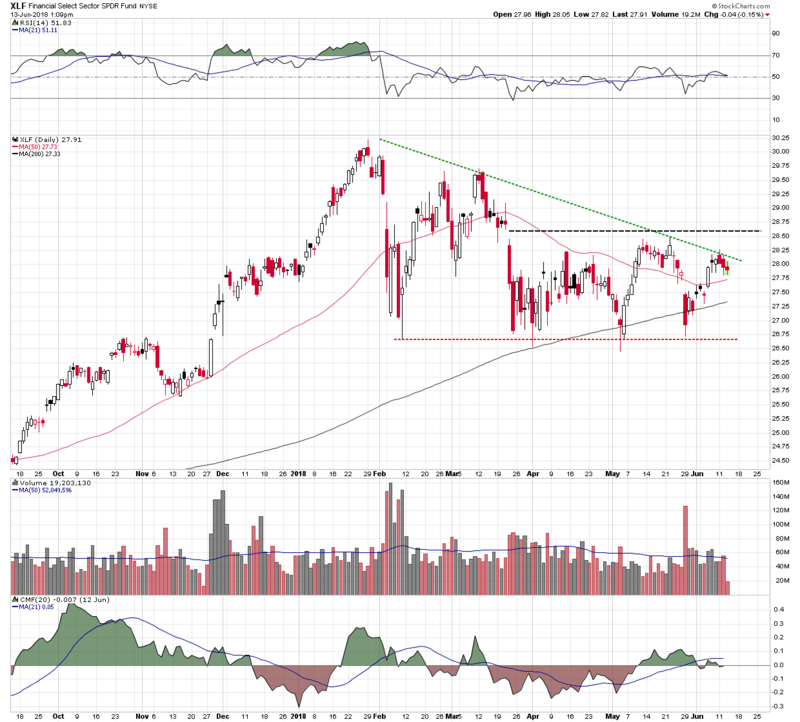 Apple shares gapped lower in late April, going on to make a bottom at the end of the month. 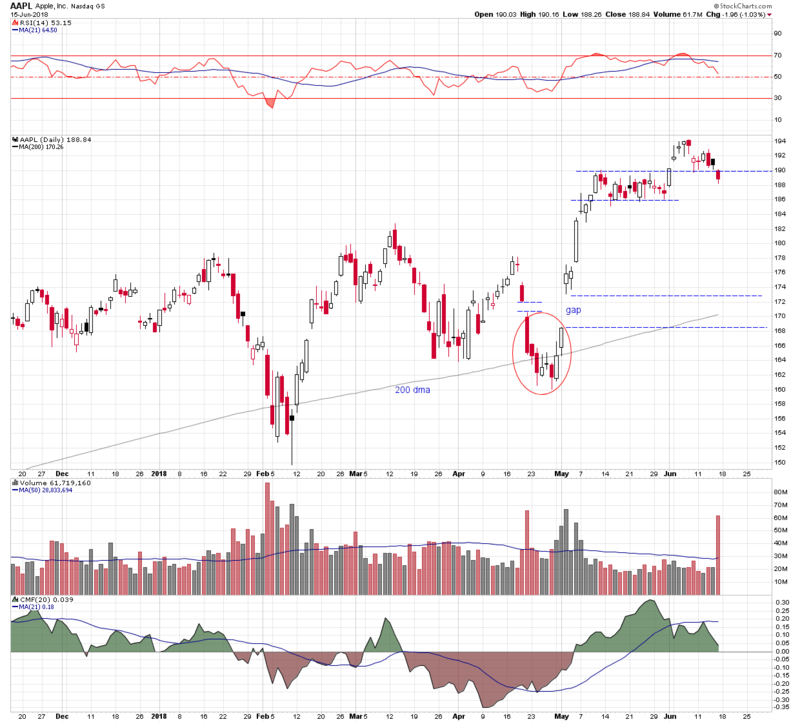 Then in early May they gapped higher, and the two gaps created an island reversal bottom. At this point they began a sharp two week rally. 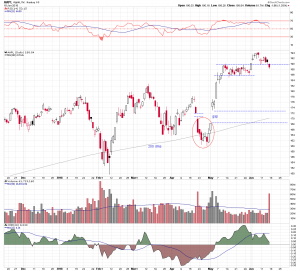 That burst of energy was followed by a period of horizontal consolidation in the final two weeks of May. Channel resistance was broken in the first week of June, but that momentum quickly faded. On Friday shares closed back below the $190 channel resistance-turned-support line. The relative strength indicator has dropped below its 21 period average and is close to breaking its center line. A reflection of the loss of positive momentum. 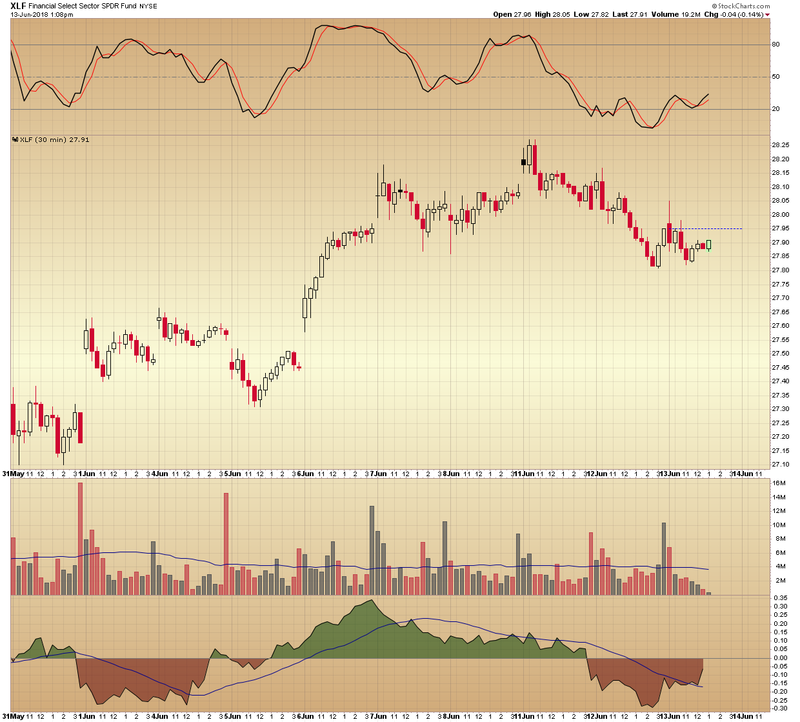 Volume spiked higher and the accumulation/distribution line suggests that the stock was under selling pressure. 1. Apple shares have been under performing their technology peers. 2. The technical indicators reflect a loss in upside momentum and positive money flow. 3. The stock recently made a failed breakout. 4. The failed support level now becomes resistance and a nearby level to calculate a close percentage stop loss. 5. The horizontal channel bottom at $190 is the first level of potential downside, below after this there is little in the way of additional support until the 200 day moving average and the early May gap in the $168 area. A stock like Apple can turn on a dime and quickly embarrass any analysis, fundamental or technical. But the trade is clearly defined and a has a solid risk/reward ratio. The only other requirement is the understanding that it is a short term speculative counter-trend trade, and requires disciplined money management. It seemed like a fairly neutral statement by the Fed this afternoon, accompanied by the expected 0.25% rate hike. The major market averages had remained stable immediately following the Fed statement but then sold off into the close. The Dow was down today -119.53, the S&P 500 off by -11.22, and the NASDAQ Composite settled -8.09 lower. 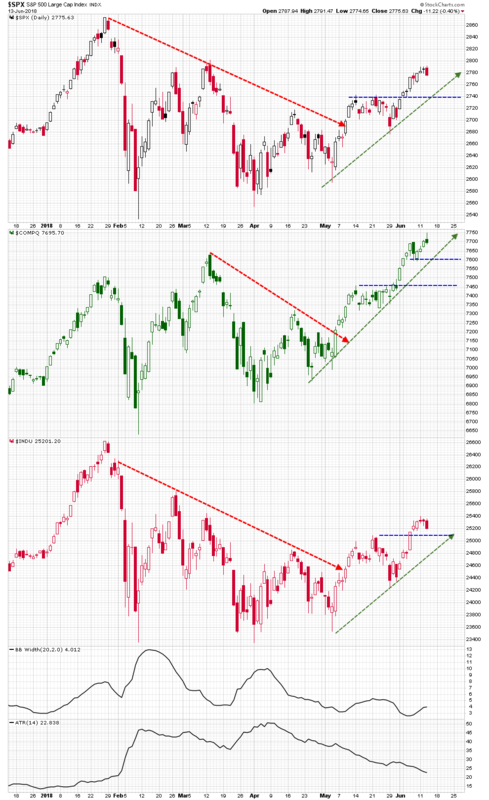 Not big moves but since the daily average true ranges of these indexes has been shrinking, bearish engulfing candles formed on the Dow and S&P 500 index charts. A shooting-star like candle formed on the NASDAQ chart, a candle with high upper shadow or wick and a close near the low of the day. That is the takeaway from today’s action, the indices closed very near their lows of the session. The first time this has happened this month. Granted a bearish engulfing or high wick candle reflects just one day’s worth of price action. It’s based on a small amount of data but this rally is based on a small amount of stock data. The NASDAQ for example, is heavily weighted to a small number of stocks in the technology space. Just five stocks account for over 45% of the weighting in the Nasdaq Composite. It’s all good when they are being bought but when that reverses, it will take down the rest of the components in the index. Here’s a look at the Financial Select Sector SPDR Fund (XLF) just ahead of this afternoon’s Federal Reserve announcement. These are the major support and resistance levels as we see them on the daily chart. And an intraday view of price action as represented on the 30 minute chart. Right View Trading was featured on Tuesday’s “Off the Charts” segment of Mad Money last night. 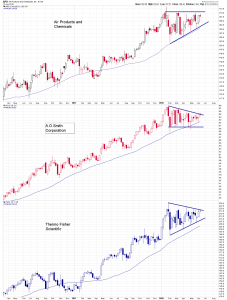 The analysis featured four potential “breakout” stocks in four different sectors. Jim Cramer does a great job explaining the “pictographs” and we appreciate the opportunity to be featured on the show. Cramer: Edwards Lifesciences’ stock chart just flashed a hugely bullish pattern from CNBC. Here’s a link to a synopsis of the segment by Tom Bemis of TheStreet.com. 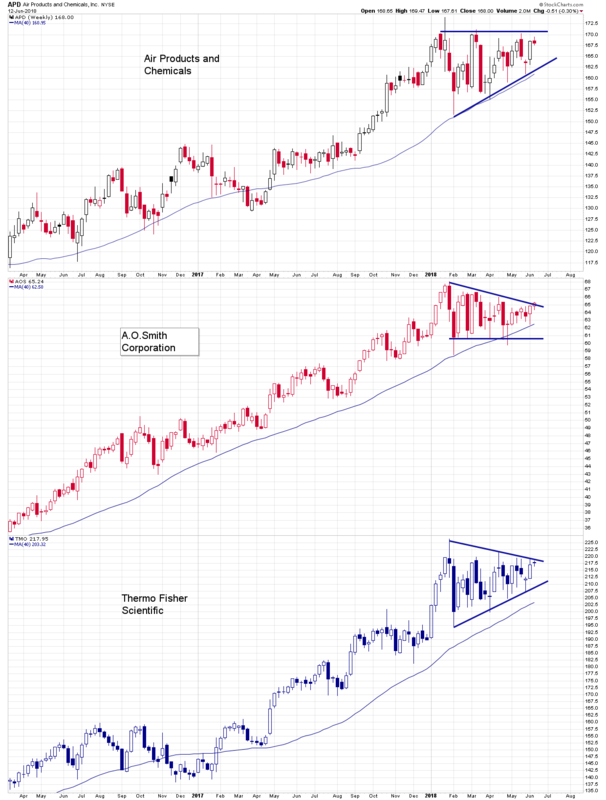 Here are three stocks with triangle patterns on their weekly charts and each is currently testing pattern resistance. 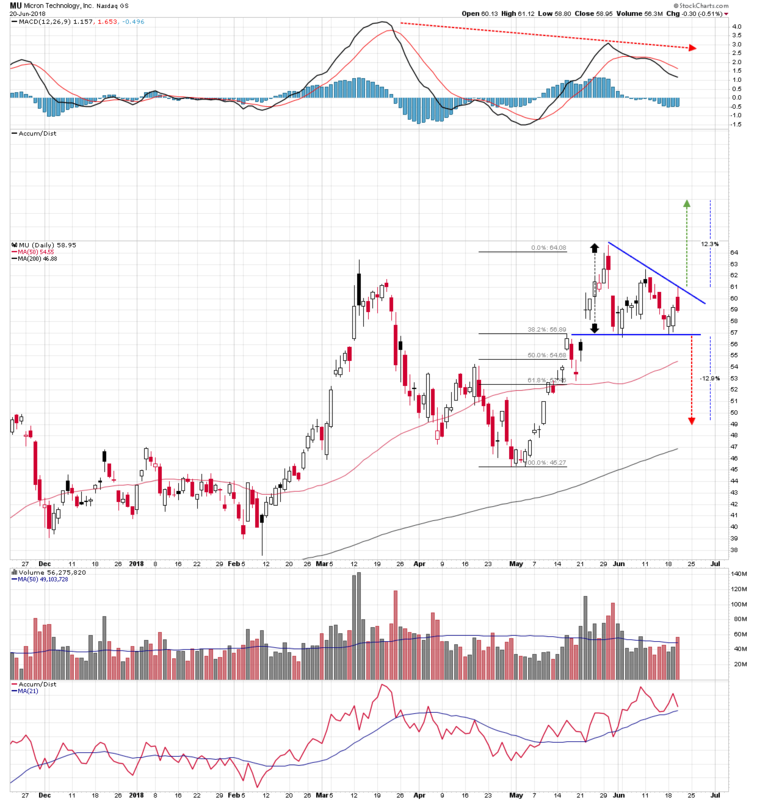 A rising triangle pattern has formed on the Air Products and Chemicals (APD) weekly chart this year. Horizontal resistance is situated in the $172 area. On the A.O. Smith Corporation (AOS) chart a declining triangle pattern has developed. In Tuesday’s session the current $65 level is being penetrated. Finally, there is a symmetrical triangle formation on the Thermo Fisher Scientific (TMO) weekly chart. Resistance here is also being tested strongly. These patterns represent consolidation of previous gains and now the potential breakouts suggest an imminent resumption of the primary trends.